Multimedia Platforms, Inc., the only LGBTQ publicly traded media company, today announced closing on the acquisition of New York's leading gay lifestyle weekly resource Next Magazine from RND Publications. Next began publishing in 1993 and today has over 50,000 weekly print readers, in excess of 120,000 monthly on-line unique visitors, 14,000 Twitter followers and a following on Facebook that exceeds 75,000 fans. Multimedia Platforms current Vice President and Chief Operating Officer, Kevin Hopper, will be appointed Publisher of NEXT. With the closing of Next, MMPW has further consolidated the LGBTQ media marketplace by connecting top brands in top markets to create one, unified, national brand. These markets represent highly sought after target areas for Fortune 500 companies to reach a large percentage of the $850 Billion total purchasing power of the U.S. LGBTQ community. Leading global brands including Marriott, Nike, American Airlines, Starbucks and Walmart have all displayed support for the community and increased their advertising efforts targeting this loyal and influential community. Strategically, the Company has acquired assets consisting of rich content, leading industry writers, loyal readers/subscribers and social media followers within key LGBTQ community marketplaces, now including New York. Other assets and key marketplaces are 80 U.S. cities through FunMaps® and Florida through the Florida Agenda and Guy Magazine. Multimedia Platforms Inc. ("MMPW") is a publicly traded industry-leading Multimedia Technology and Publishing company that integrates print media with social media, and related online platforms, to deliver information and advertising to niche markets. MMP teams utilize its proven business model to deliver niche publications and online platforms that target one of the most sought-after demographics in the world, the Lesbian, Gay, Bisexual and Transgender population. MMP has recently expanded its concept to include video and mobile applications reaching deep into the international LGBTQ community. MMP's top brands include The Agenda, a Florida-based weekly LGBTQ newspaper covering world, national and local news and events; and Guy Magazine, a weekly entertainment and lifestyle full-color publication covering the burgeoning South Florida LGBTQ marketplace. MMP's plan to interweave print, web and mobile delivery of the highest quality news and entertainment information via a variety of platforms crosses all cultural, generational and preferred modality barriers to reach an unprecedented audience. Next Magazine is "New York's Gay Guide" -- a weekly comprehensive lifestyle resource for all gay New Yorkers, regardless of skin color, ethnic background or economic status. Since 1993, we have aimed to highlight both the popular and under the radar events, personalities and products that appeal to such a diverse range of gay men, especially when those stories are about gay New Yorkers themselves. 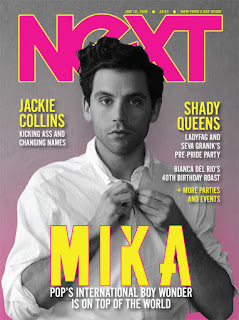 Colorful, fun and always with a good sense of humor, Next's provocative commentary on nightlife, entertainment, politics, fashion, sports and celebrity informs its community and engages its readers in order to help the Big Apple maintain its vital and supportive gay legacy. Next Magazine is available on a weekly basis throughout New York City, Upstate New York, New Jersey, and Fire Island, and 24/7 internationally through its web component, NextMagazine.com.